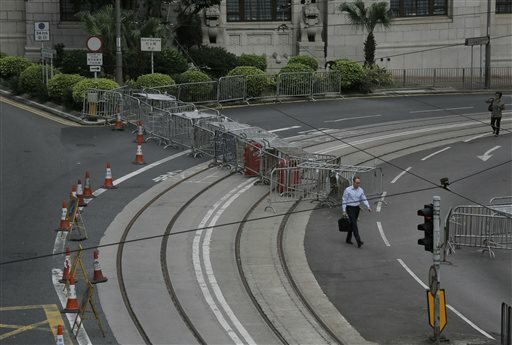 HONG KONG (AP) — Talks between the Hong Kong government and student leaders of a democracy protest that has blocked main roads in the Asian financial hub for nearly two weeks are canceled because they’re unlikely to be constructive, a senior government official said Thursday. Chief Secretary Carrie Lam said the talks scheduled for Friday will not go ahead because they have been “seriously undermined” by remarks from the student leaders. Umbrellas used to combat police pepper spray and tear gas have become a symbol of the nonviolent movement. Student leaders had vowed earlier Thursday not to retreat even as the number of protesters occupying the main thoroughfare and streets in two other districts across the former British colony has dwindled sharply this week. Pro-democracy lawmakers, who so far haven’t played much of a role in the protest movement, said they would join in by blocking all government funding requests in the legislature except for the most urgent. “I truly regret that we will not be able to have a meeting tomorrow which will produce any constructive outcome,” Lam said. 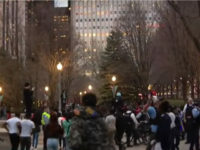 Protesters have occupied the streets since Sept. 28, when police used tear gas in a failed attempt to disperse tens of thousands of people trying to demonstrate in front of the government complex. The protesters are demanding the government of the specially administered Chinese region abandon plans to allow Beijing to screen candidates for the city’s inaugural elections for its leader in 2017. They also want the current Beijing-backed leader, Leung Chun-ying, to resign.